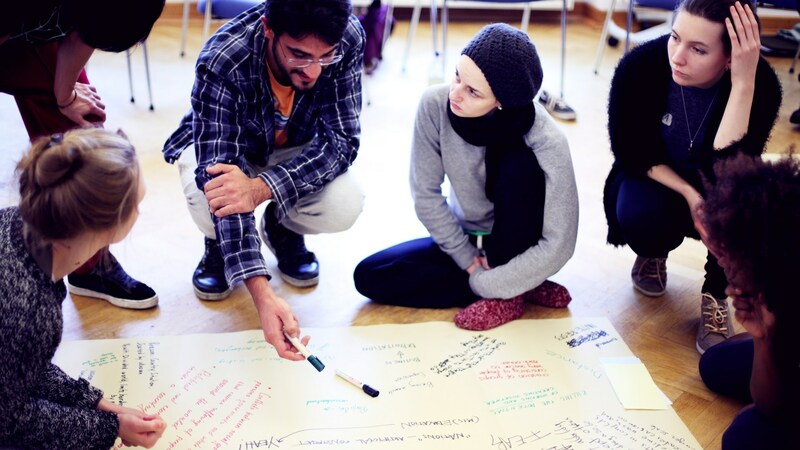 In the ROOTS & ROUTES network, partner organisations with a diverse range of approaches to arts, culture, education and professionalisation collaborating for more than a decade have jointly developed a common methodology. ROOTS & ROUTES workshops and masterclasses are practical. Artists who attend ROOTS & ROUTES workshops usually start working on their projects from day one and end up performing on some stage or recording. Part of the ROOTS & ROUTES methodology is to get participants to coach each other: the ones with more experience share their knowledge and skills with newcomers, alongside professional coaches. Key to successfully creating an artwork/performance together with other artists, even without knowing them, is team work. We rely on collaborative learning techniques such as exchange of experiences, collective brainstorming, improvising, try-outs, reflection and evaluation of the results and the process. Our participants get the opportunity to reflect on their own learning process by identifying their own learning needs and assessing their progress by means of especially developed rubrics. In all ROOTS & ROUTES courses, workshops and residencies, attention is given to mutual understanding and respect for the other, regardless their artistic, cultural, or religious background.